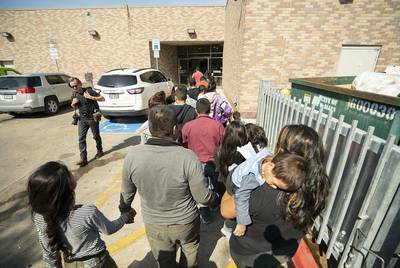 "Chaos at the Texas-Mexico border: Scenes from Tornillo to the Rio Grande Valley" was first published by The Texas Tribune, a nonprofit, nonpartisan media organization that informs Texans — and engages with them — about public policy, politics, government and statewide issues. 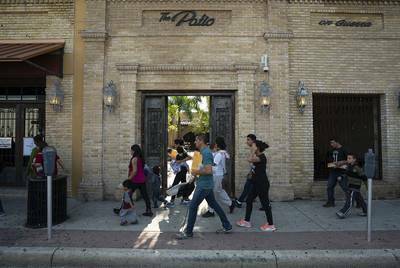 From the Tornillo Point of Entry south of El Paso to the Rio Grande Valley hundreds of miles away, this weekend was a blur as uncertainty around the Trump administration's "zero tolerance" policy sparked more questions than answers. Our reporters, photographers and videographers have been on the ground. Here is some of what they saw. Chaos at the Texas-Mexico border: Scenes from Tornillo to the Rio Grande Valley By Alana Rocha, Jacob Villanueva and John Jordan June 24, 2018 Alana Rocha From the Tornillo Point of Entry south of El Paso to the Rio Grande Valley hundreds of miles away, this weekend was a blur as uncertainty around the Trump administration's "zero tolerance" policy sparked more questions than answers. Our reporters, photographers and videographers have been on the ground. Here is some of what they saw. Friday, June 22 U.S. Sens. 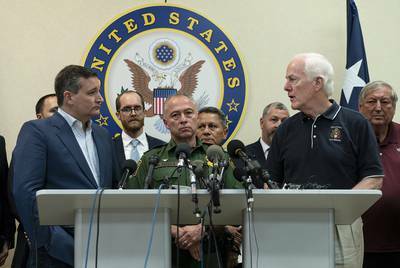 Ted Cruz and John Cornyn hold a press conference at the Border Patrol station in Weslaco on Friday, June 22, 2018. They were joined by Rio Grande Valley Sector Chief Manuel Padilla (center) and local mayors. 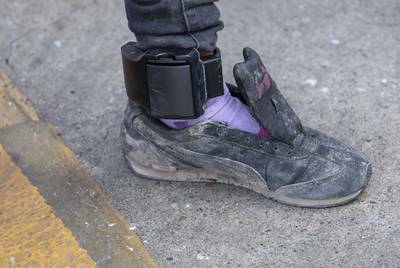 Reynaldo Leal for The Texas Tribune An immigrant at a bus station in McAllen shows her ankle monitor. 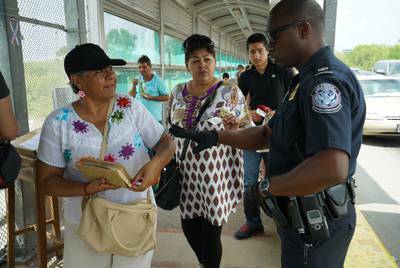 Bob Daemmrich for The Texas Tribune Saturday, June 23 A U.S. Customs and Border Protection officer on the international bridge between Brownsville and Matamoros, Mexico, on June 23, 2018. Some asylum seekers camped out for days on the bridge. 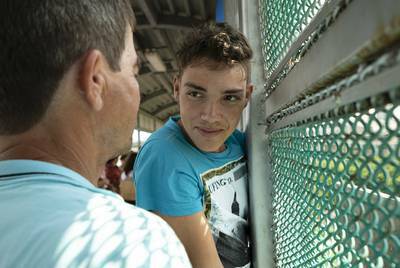 Reynaldo Leal for The Texas Tribune Washington Moreira Batista, 17, waits on the Brownsville/Gateway International Bridge with his father, Jose Moreira Nunez, 52, for their chance to apply for asylum in the United States. 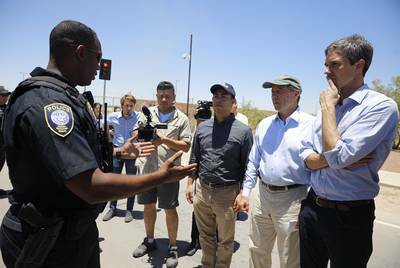 Reynaldo Leal for The Texas Tribune U.S. Rep. Joaquin Castro, D-San Antonio; U.S. Sen. Tom Udall, D-New Mexico; and U.S. Rep. Beto O'Rourke, D-El Paso, get instructions prior to touring the tent city at Tornillo Port of Entry. 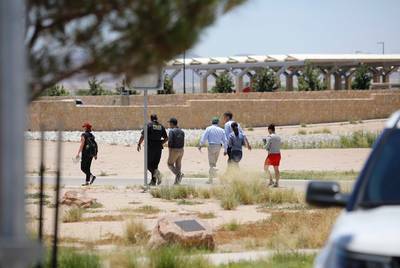 Jorge Salgado for the Texas Tribune Castro, Udall and O'Rourke, accompanied by aides and a Department of Homeland Security officer, approach the tent city in Tornillo. 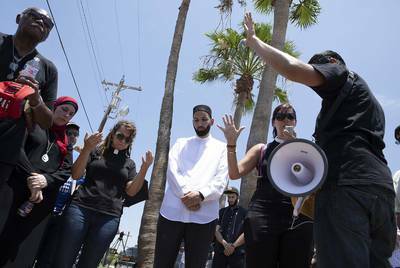 Jorge Salgado for the Texas Tribune Religious leaders gather for a rally at a Border Patrol station in McAllen. 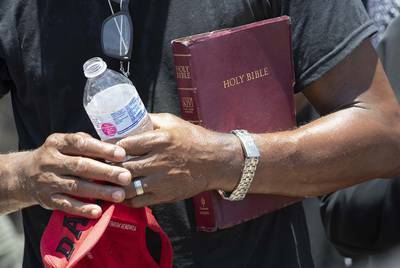 Bob Daemmrich for The Texas Tribune A Dallas minister holds a Bible outside the immigrant detention center in McAllen. Bob Daemmrich for The Texas Tribune Immigrants, many wearing ankle monitors, are dropped off at the McAllen Central Station, where they are they are given bus tickets to other parts of the country. Reynaldo Leal for The Texas Tribune Other families who have received bus tickets and instructions are taken to the Catholic Charities shelter in downtown McAllen. Reynaldo Leal for The Texas Tribune Jose and his sister, Genesis, smile and play at the McAllen Central Station. The family waited for days on the Gateway International Bridge in Brownsville to apply for asylum. They were at the station to get bus tickets. Reynaldo Leal for The Texas Tribune "Chaos at the Texas-Mexico border: Scenes from Tornillo to the Rio Grande Valley" was first published at by The Texas Tribune, a nonprofit, nonpartisan media organization that informs Texans — and engages with them — about public policy, politics, government and statewide issues. Link back to the original article, which is located at https://www.texastribune.org/2018/06/24/photos-texas-mexico-border-shelters-protests-tornillo-el-paso/.